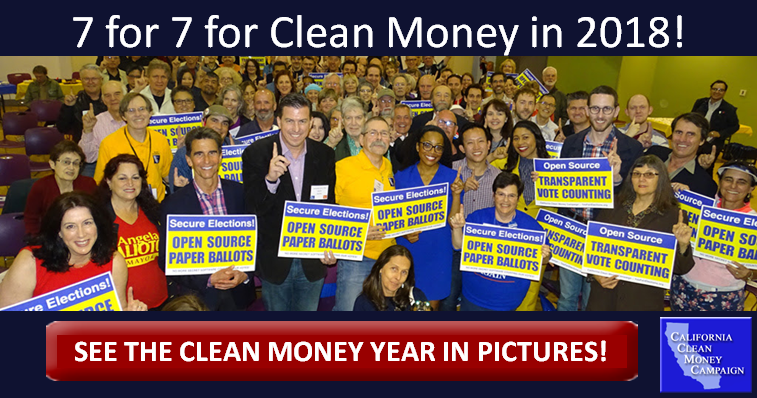 Historic Clean Money Year in Pictures! Striking Next Blows Against Secret Money! — 7 of 7 Clean Money Priorities in 2018! WIN! Social Media DISCLOSE Act (AB 2188, Mullin). Makes ads on Facebook, Twitter, etc. show top 3 funders! WIN! Restore Net Neutrality to CA (SB 822, Wiener)! WIN! Stop Abuse of CA DISCLOSE Act (AB 2155, Mullin). WIN! One Website With All Electeds (AB 2707, Mullin). WIN! Initial Funding for Open-Source Paper Ballots. WIN! Risk-Limiting Election Audits. (AB 2125, Quirk). READ ABOUT the strongest on-ad disclosure law in the nation — and now in effect! Authored by Assembly Speaker pro Tem Kevin Mullin and sponsored by the California Clean Money Campaign. Citizens United unleashed unlimited, anonymous spending on campaigns nationwide. That's why we sponsored the California DISCLOSE Act and worked for 7 hard years organizing one of the largest grassroots and coalition efforts ever seen in California — resulting in Governor Brown signing AB 249 into law! • Lets voters know who really is paying for political ads — on the ads themselves. • Ballot measure and SuperPAC ads will have to clearly and prominently list their three largest funders. • "Follow-the-money" earmarking disclosure stops ballot measure ads from deceiving voters about who pays. • Applies to television ads, radio ads, robocalls, print ads, and online ads. See the story of how Clean Money activists helped us this historic victory here and read the Huffington Post interview of Clean Money President Trent Lange about it here. But we're not done yet! We must defend and expand AB 249 to address all the ways secret money tries to buy elections and unfair influence. Now, help us pass SB 47, the Petition DISCLOSE Act, our bill to require paid initiative signature-gatherers to tell voters who's paying for them, stopping bad initiatives from getting on the ballot by hiding who's behind them! Why Clean Money and Fair Elections? to voters instead of to big money contributors? So do we. The solution is Fair Elections public funding of campaigns for qualified candidates who agree to strict spending limits. Working with nearly 300 statewide, local, and national organizations for California Clean Money and Fair Elections. The California Clean Money Campaign is a non-partisan 501(c)3 non-profit organization whose mission is to achieve an open and accountable government in California by building statewide support for public funding of election campaigns. Proposition 59, Overturn Citizens United Act, passes! Berkeley Passes Measure X1 for Public Financing With 65% of the Vote! Governor Brown Signs SB 1107, Major Step Towards Citizen-Funded Elections! Have Amazon donate 1%-10% of your purchases! Watch the compelling Bill Moyers video.